Sometimes it can be nice to have an easy to make comfort food main dish for your holiday meal. In that case, a delicious pasta is always a good option. The recipe I am sharing with you today tastes rich and delicious, but it actually happens to be vegan and gluten free! 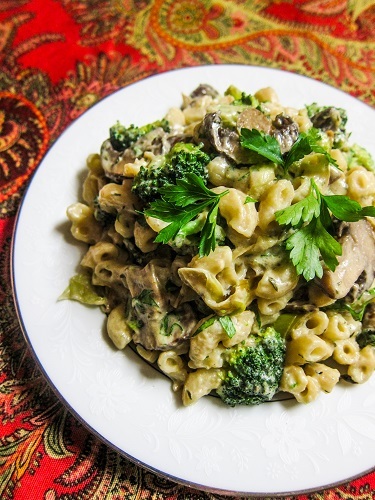 I combine sauteed broccoli, mushrooms and leeks with a creamy “alfredo” sauce that is actually made from cashew butter and coconut milk and it is not only easy to make, but your guests and family will love it! It tastes as good as traditional alfredo, only it is better for you! Cook the pasta according to package directions, reserve about 1/4 cup pasta water, and then drain and set aside. Meanwhile, while the pasta is cooking, heat the oil in the bottom of a large ceramic skillet over medium heat. Add the leeks and mushrooms and sautee for a few minutes until starting to soften, then add the broccoli, thyme and garlic and cook, stirring often until all of the veggies are tender to your liking. Add the white wine and cook for a minute more, then remove from heat while you whisk together the sauce. Whisk together all of the sauce ingredients, then pour it over the veggies, and add the pasta. Stir until it is all combined, adding that reserved pasta water if needed if the sauce seems too thick. Place back on the heat for a minute or two if it has cooled down at all (stirring constantly so it does not stick to the bottom). Add the parsley and serve!